Transition from the practice field to the game field starts with adjusting the mindset of a player at training from defending to attacking and vice versa. As the game moves from 3v1 to 5vs3 in a larger area the defenders must remain compact in defence and deny the THROUGH passes. Pressure, Support, Cover. Starting Point 3vs1 centrally playing 1 touch or 2. 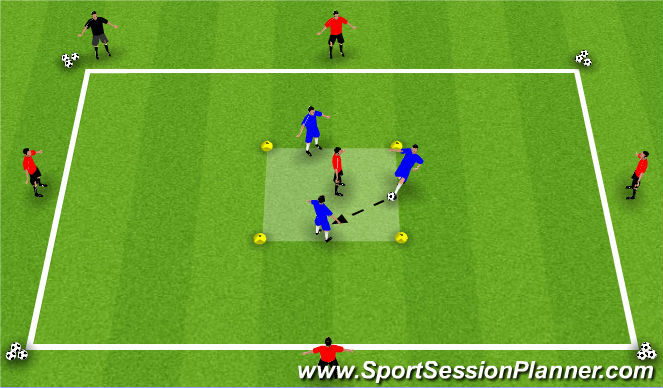 When the defender wins the ball, s/he plays out to the 4 outside players who keep possession, making it a 5vs3. Players on the outside must stay and move along the lines.When the defenders win possession then, they play 2vs1 against the central player.